She has the best panels and great conversations about the events of our time. Have been listening for years, now by podcast. I don't have TV or newspaper, and the 2 Friday news round-ups are a quick and engaging way to keep up. Guests are genuine journalists who try to give a balanced report/discussion. Caller's questions are generally good. Definitely some conservative callers who take guests to task if they seem biased, with good, non-defensive responses from guests. iTunes: Can't DL show on iPhone, Hello! This show is informative, and worth waiting for. There are only a few months left, but this podcast is sooo worth 50 minutes of your time to catch up on the week'snational and then international news. Used to be excellent. But for the last several months the podcast obviously ends before the radio program ended. Almost weekly the a panelist is talking about an issue and the podcast ends in mid-sentence. Typical liberal , beltway, media jibber jabber. Sad thing is my tax dollars are helping to fund! The Domestic segment is ESSENTIAL listening! The content is great, but your program feed doesn't update. the subscription does not work. I absolutely LOVE this show and try to catch it live whenever I am able. With the pending demise of NPR's 'Talk of the Nation' Diane's show is one of the few remaining fairly minded call-in talk shows that remain for those of us not on the far right to listen to. But, I recently subscribed to the podcast of Friday's 'news' roundup' and all I am getting is the International Hour. Although it is a great hour to listen to, I wanted the domestic side of the news too. I am sure it is some kind of technical glitch and once corrected there is no doubt that I will give the show the five stars it deserves! iPhone Podcast App Broken - APPLE PLEASE FIX! Great podcast. However, note that this podcast works fine everywhere but in the iOS podcast app. If you are having issues, try another mobile podcast client or use the iTunes desktop client. APPLE, PLEASE FIX THIS! I rely on the podcast to listen to Diane but the Friday show seems to not have been updated in a few weeks now. Where is it? The show content is a 5/5, but the producers utterly ignore the people who try to access their content via iTunes. The updating of this podcast feed is nothing more than a 1/5. I have to believe that podcasting is and will grow to be an even more important distribution channel for the DRShow. It's a shame to not see them take it more seriously. I wish this podcast worked. It's a shame that a great show as this should have such a poor podcast support. Diane continues to do a magnificent job that I have relied & expect of her every week for the past 15 yrs since I came to the USA. Nothing will deter me from listening to this show let alone this broken podcast. I adore this show and especially the Friday News Roundup, enough so that I listen to the podcast regularly as an American living in Switzerland. That said, but the podcast through iTunes is clearly a low priority. The FNR loaded is often the incorrect one for the date broadcast provided and, because the FNR podcasts are all named the same week after week the subscription is useless. I really wish they would get this right. Subscription does not update for Friday news. I also receive playback errors from iTunes Store. Please resolve as I used to be a avid fan of this podcast. Please stop naming the Friday News Roundups with the same name each week. The iTunes Store does not recognize new episodes that have identical names—and therefore does not tell anyone's iPhone to update. The issue is easy for you to fix but VERY annoying for us! After May 8th my podcast app will not down load the most recent episodes of the show, I have to so the the store, search and stream them from there. Please resolve this. 4/5 due to update issues. Please address the strange podcast update issues. I listen to every minute of every show. If only they'd: make it 2 podcasts (so they'd both download automatically) & edit out the gaps. Great program. I have to go to store and get most recent program. Subscription does not seem to consistently provide updates. I like the show but though I am subscribed to the Friday News Roundup new episodes do not appear in my library in the podcast app. You can ditch the paper and NPR Morning Edition and All Things Considered. Wait till Friday and get a full, thoughtful, considered story of the weeks news…including a full hour of international news which often gets neglected for actors or singers. Want a full picture? Do the Diane Rehm Friday News Roundup, PRI The World, Backstory and My History can Beat your Politics. Your IQ will thank you. I love this show. The domestic round up is always spot on. Sometimes, I can't download the international hour - but when it loads correctly - it is equally on the mark. Diane and wamu (dc's NPR affiliate), keep up the great work! I love the civility and even-handedness of Diane Rehm's News Round-up. Diane sets a high bar for the tone and quality of the weekly issues review. Her panel guests are knowledgeable and represent a full range of perspectives. I like the fact that Diane refuses to tolerate rudeness from her panel guests as well as from listeners who call in. Best talk show anywhere. Objective, fair, intelligent, and NOT inflammatory, biased, or partisan. If you want to hear all sides of an issue without the shouting and hate, I recommend this show highly. Boring boring boring. I hate this show. The best thing about this show is that Diane is gone all the time, which is great because the show isn't half bad when she's gone. I really wish this show wasn't on my local affiliate. Busy week...this will catch you up! Diane Rehm is a highly professional moderator who runs an exemplary program each and every day. Regardless of her personal politics, she always is fair and gives all points of view respect and an opportunity to be heard. The discussions are in depth and she has excellent panelists who have expertise and diverse viewpoints without the screaming head syndrome. Even the callers generally have good points since she attracts a highly educated audience. This is about as good as it gets. I find Rhem's interviewing style to be incredibly distracting. Maybe it's more her speech, it's very halting. The content is great, I just can't concentrate when she's talking. I absolutely love the Friday News Roundup (and the show in general), and I'm super grateful that it's available on podcast...but jeez, can't they edit out the 3+ minutes of muzak throughout the show? Please? Until then the podcast only gets 3 stars from me...which I know is kinda mean...but I just can't take it! I love the Diane Rehm show!! Diane herself is a great moderator for civil discussions and the topics they cover on the show are diverse and intelligent. Highly recommended! I'm going to be in Italy through June 08 and it's a treat to be able to listen to her... given the time zone, for me it will be the *Saturday* news roundup, so I will enjoy it even more with my lazy cappuccino breakfast. Thank you NPR! Get it right! This is not the news roundup! Get it right! This is not the news roundup! And it's not the first time the wrong show has been posted. Cant believe the Diane Rehm is on a podcast, thank you NPR and Diane. Informative, knowledgable a great way to spend an hour or so and learn all you would want to about any subject. Again thanks! So the last update of this podcast was Feb 16 and now it says that this is no longer a valid URL in my podcast folder. Not sure what's going on, but one thing is certain, this podcast has been dead for a week now. What gives? 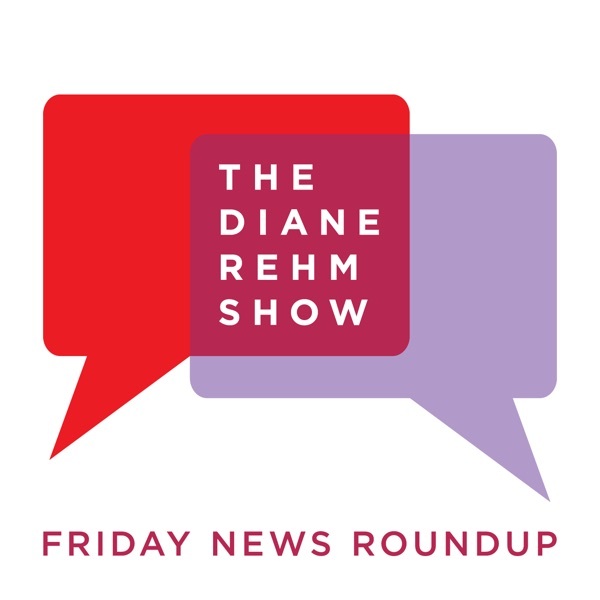 I love the Diane Rehm show, especially her news round-up. The show covers all the big issues of the day in a civilized and non-confrontational manner, always taking great pains to present a diverse array of opinions. The show is a gem and a much better alternative to the bombastic, cynical clap-trap heard on other radio and tv shows. I would gladly pay to listen to Diane Rehm-- it's that good! Why is only one hour of the expanded news roundup being podcast? One hour is better than nothing, but why not podcast both the domestic and international segments? I am away from my radio when the News Roundup airs. I used to record the show to a cassette tape and listen in my car later. Podcasts like this finally convinced my to buy an iPod. Thank you NPR, WAMU and the folks at the Diane Rehm Show! I look forward to Friday mornings because of this podcast. Anyone else notice the weird whistley breathing that happens whenever Tony Blankley is on the show? I love this podcast - It's been a reason to go to work late on Friday, and always a good spectrum of views...(although I'll miss James Fallows as he heads over to China). But today's podcast is only 12minutes long. Any ideas why? Top Notch Weekly News Coverage! This is my absolute favorite weekly news show, I never miss it now that it's podcasted. Fair minded, incisive, in-depth and truly wise coverage with a rotating "who's who" roundtable of commentators from both sides of the ideological aisle. I don't think this can be topped! Life has been so hard as an expat. No time to sit and listen to Diane's streaming audio. Then, I failed at trying to rip the streaming audio files to get my Diane Rehm fix. Finally, now, I can get my Friday news roundup. Give me podcasts of the full two hours daily and Kojo Namdi's show (especially the Maryland News Hour) and I won't need any other podcast. I'll become a member again just to thanks, WAMU! I have listened to Diane Rehm (the absolute best radio news/talkshow host) for almost 20 years ... on and off depending on whether I could be in the car or by a radio ... now I can count on a weekly dose of intelligent and well balanced news analysis from Diane no matter what my schedule ... Hooray for podcasts, hooray for Diane!